In recent years transboundary natural resource management has become a popular concept in southern Africa and Transfrontier Conservation Areas (TFCAs) and Parks (TP’s) have been established in several areas. Gonarezhou is an important part of the Great Limpopo Transfrontier Park, (GLTP), which is one of the first of these international conservation areas. The GLTP agreement was signed by the heads of state of Zimbabwe, South Africa and Mozambique in 2002 to create a shared conservation and land use vision for the ecosystem. 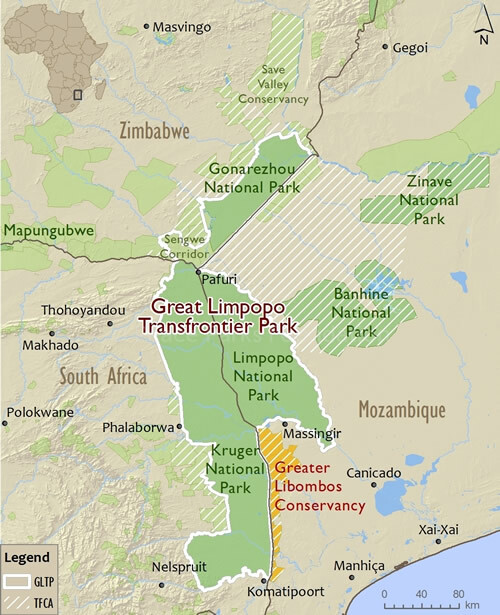 The GLTP is part of the GLTFCA which includes the Zinave and Banhine national parks in Mozambique and some conservancy areas in Zimbabwe. At least 30% of the Park boundary is also the international boundary between Zimbabwe and Mozambique. There are no officially designated conservation areas in Mozambique that directly adjoin the park. A series of game forms along a large portion of the boundary are, through a long process of engagement and discussions, however now being transformed into a conservancy, which creates further opportunities for cross-border cooperation. Wildlife corridors, both inside Zimbabwe and as part of the Transfrontier initiative, are critical for ecosystem resilience, and options for their viability and long-term prospects need to be actively pursued. Linkages to Banhine and Zinave National Parks are specifically seen as offering opportunities for preservation of landscape level ecosystem processes. In Zimbabwe, the Park is surrounded mainly by communal lands, and also adjoins The Malilangwe Trust in the north and the Malipati Safari Area in the south. Some of the seminal CAMPFIRE areas in Zimbabwe are found along the Gonarezhou’s boundaries, and offers opportunities for communities to both benefit from wildlife and to be active custodians of the land and share responsibilities for wildlife conservation and management.